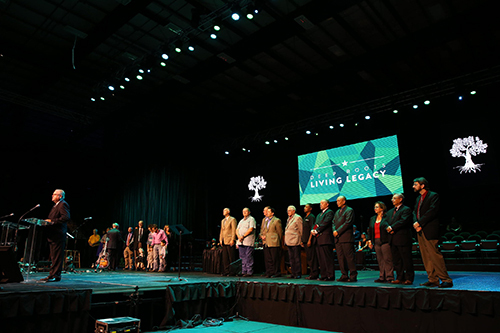 The Tuesday afternoon worship session at the Texas Baptists Annual Meeting featured a broad update on many of the missions efforts the convention has identified as priorities. Without the generosity of convention churches, none of these projects would be possible. without the generosity of convention churches, the first order of business was expressing gratitude, saying thanks and recognizing the generosity and selfless giving evident across the state. Chris Liebrum, director of the Office of Cooperative Program Ministry for Texas Baptists, honored nine churches throughout Texas for their dedicated giving to the Cooperative Program: Green Acres Baptist Church in Tyler, First Baptist Church of Grapevine, First Baptist Church of Canyon, First Baptist Church of Wheeler, First Baptist Church of Charlotte, Chinese Baptist Church in Houston, Iglesia Bautista Stonegate in Alice, Vietnamese Baptist Church in Houston and Cornerstone Baptist Church Killeen, in Harker Heights. Texas Baptists President Kathy Hillman began the Texas Missions update by sharing that Texas Baptists have helped start nearly 200 Western Heritage congregations, drawing people in to hear the Gospel through rodeos, cowboy competitions and simple, welcoming worship music. One church alone, Lone Star Cowboy Church near Lubbock, has baptized 145 people. Sandy Wisdom-Martin, executive director and treasurer of Woman's Missionary Union, shared the story of a drug-addicted ex-convict who was changed by God's work in her life through Green Acres Baptist Church in Tyler and Texas Baptist programs such as Latina Leadership and Christian Women's Job Corps. Because of the ways Green Acres invested in April Barr Castaneda's life, she went on to establish Christian Women's Job Corps in her own hometown of Pecos and now helps other women turn their lives around. "[She] snuck into a church service hoping to be invisible," Wisdom-Martin said. "She didn't accomplish her goal. Instead, church members found her and loved her back into the family." Hillman shared an update on the good work accomplished by Texas Baptists Disaster Recovery in the wake of various natural disasters this year. Hundreds of volunteers from dozens of churches have volunteered their time and energy in 2015 recovery efforts from floods in San Marcos and Eagle Pass and a tornado in Van. Convention Second Vice President Bedilu Yirga of Ethiopian Evangelical Baptist Church in Garland spoke about the collaborative mission efforts coming out of the Intercultural Strategic Partnership program. "We are building a powerful mission force right here in our state that touched lives in some of the hardest places on earth to reach," Yirga said. "For many in this room, traveling to these countries would be not even be possible, but intercultural churches can. They know the language and the culture, and they are changing the world one village at a time." Carolyn Porterfield, missional lifestyle strategist for multicultural groups for WMU, reported an astonishing 38 million people live in poverty in the United States. For the past five years, WMU has partnered with the Rio Grande Valley Baptist Association and Buckner International to help alleviate some of the extreme poverty along the Texas-Mexico border by building homes for families living in colonias. This year's home recipient told WMU volunteers that by building a safe house, volunteers "have put my family ahead by 10 years." Continuing on the theme of poverty, Hillman spoke about the increased participation seen this year in Texas Baptists summer feeding programs. She attributed the growth in part to a partnership between the Texas Hunger Initiative and Literacy Connexus to provide books as well as nutritional meals at summer feeding sites. "One mother said, 'My children never liked reading before, but since we've been coming, they eat lunch and then crawl into my lap and ask me to read to them.'" The Immigration Service and Aid Center (ISAAC) ministry at Baptist University of the Américas celebrated its second anniversary this year. René Maciel, university president and first vice president of Texas Baptists, said three program clients have accepted Christ. The Hardin-Simmons University choir performed arrangements of "We Gather Together" and "Hold On (Keep Your Hand on the Plow)." James Kimmel, associate pastor of music and worship at Columbus Avenue Baptist Church in Waco, led attendees in traditional hymns and worship songs. Lauren Sturdy serves as Prospect Research Coordinator for Buckner International.